The need for health services continues to be felt in many of the remote communities of Papua New Guinea. This need was experienced again recently when a first- time father was faced with the likelihood of losing his wife after she developed complications following the delivery of their first son in the village. Josephine Barak gave birth two weeks ago with the help of Zenon Philip, a Village Birth Attendant trained by Morobe Mining Joint Ventures (MMJV) in one of its health programs. VBA Zenon had to travel some distance up the Watut River from her village of Malarina after receiving the call for assistance. Soon after the delivery, the young mother developed pains and could not move. The first-time mother from Wawas village in the Middle Watut area of Morobe Province was discovered by a team of Environment and Community Affairs officers from the Hidden Valley mine during a routine patrol along the Watut River communities. The team, using a satellite phone communicated the emergency to the Wafi-Golpu project office. 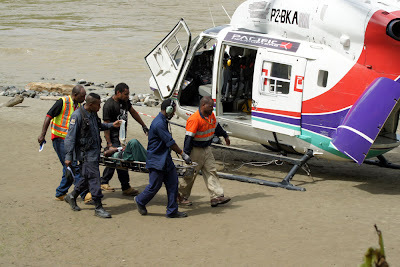 Timon Ifame, a male nurse was flown by helicopter to the village and attended to the patient. After performing medical checks, he concluded that the patient needed to go to Angau Hospital. Ms Barak was medivac by helicopter to the Lae Hospital, accompanied by her husband, new born son and VBA Zenon. She is one of the many local people from the remote communities that have been assisted by MMJV operations at Hidden Valley Mine, Wafi-Golpu project, and Regional Exploration.